A new species of large, Middle Jurassic carnivorous dinosaur has been described. Writing in the academic journal “Palaeontologica Electronica” the researchers, which include Dr. Oliver Rauhut, (conservator at the Bavarian Collection for Palaeontology and Geology), identify this new Theropod as a member of the Megalosauroidea. Named Wiehenvenator albati, it could be a potential sister taxon to Torvosaurus and a dinosaur that might have been about the same size as Torvosaurus gurneyi, reaching an estimated length of around ten metres. The picture above shows the known fossil bones of Wiehenvenator. Fragmentary fossils including elements from the skull and jaws, caudal vertebrae, ribs and bones from the lower legs and ankle were excavated from a disused quarry located in Northrhine-Westphalia (Germany) back in 1999. The fossils were found by chance, it was a routine inspection, however, once the first bones had been discovered a field team was brought in to ensure all the fossil material present could be collected. The strata in which the fossil material was found are Middle Callovian in age (around 163 to 165 million years old) and they represent marine sediments. During this time, much of the land that was to form western Europe lay under a warm, shallow tropical sea. A number of small islands existed and it seems that this archipelago was home to this hunter, a dinosaur that is estimated to have weighed more than two tonnes. The skull and jaw fossils located in their anatomical position (Wiehenvenator). Nicknamed “The Monster of Minden”, due to the town’s close proximity to the fossil dig site, Wiehenvenator was probably the apex predator on the island archipelago. The teeth associated with this dinosaur are strongly recurved with the root making up more than two thirds of the tooth length. The largest teeth identified so far (from the maxilla), measure in excess of 13 centimetres long. The strongly recurved teeth of Wiehenvenator. The picture above shows various views of the fossil teeth associated with the jawbones or found as loose items at the dig site. The scale bar for 1 and 2 is 1 centimetre, the scale bar in the other images represents 5 centimetres (except picture 9). The dinosaur was named Wiehenvenator for the Wiehengebirge, a chain of hills south of the town of Minden, where the holotype specimen was found and venator, Latin for hunter. The trivial name honours Friedrich Albat, who found the holotype specimen. The discovery of Wiehenvenator adds to the number of large Theropods known from the Callovian faunal stage of the Jurassic. The research team comments on the number of large Theropods from the Middle Jurassic that are classified as Megalosauroids and they suggest that a rapid radiation of Megalosaurs is suggested between the Toarcian and the Bathonian faunal stage of the Jurassic (approximately 183 to 166 million years ago). The scientists postulate that this radiation and increase in the number of Megalosaurs was probably triggered by the Pliensbachian-Toarcian extinction event that took place around 183 million years ago. They comment that this extinction event may have been more significant for Theropod evolution than the larger end Triassic mass extinction. The team then go on to review the changes in Theropod genera that took place from the Middle Jurassic onwards. The picture above shows two views of the right maxilla of Wiehenvenator albati, top (1) lateral view and bottom (2) medial view. The fossil record indicates a faunal turnover from Megalosauroidea dominated Middle Jurassic to Allosauroid/Coelurosaur dominated Late Jurassic Theropod faunas. The researchers plotted the number of different Theropod fossils found globally between the Middle Jurassic to the Late Jurassic. Although the paucity of the fossil record makes a complete analysis impossible, the team did infer that there was a change in the proportion of different types of Theropod dinosaur represented as the Jurassic progressed. The once dominant Megalosaurs were replaced by Coelurosaurs and Allosaurs. A fossil record comparison of Theropods (Middle Jurassic compared to Late Jurassic). Theropod faunal turnover (taxa estimated to be >250 kgs in size). When body mass is considered and Theropod dinosaurs estimated to be less than 250 kilogrammes in weight are removed, the impact of the rise in the number of Coelurosaurs is lost, suggesting that these dinosaurs did not rise to the apex predator niche during this period. Large megalosaurids which dominated the apex predator niche globally during the Middle Jurassic had been substantially replaced by allosaurids by the end of the Jurassic. The scientists are quick to point out that these figures are not conclusive, bias because of the large number of Theropods from the Upper Jurassic Morrison Formation is discussed along with the difficulties of undertaking analysis of this sort due to the relatively poor fossil record of large meat-eating dinosaurs over the time period studied. However, an analysis of environmental preferences of Allosauroids and Megalosauroids indicates that the former preferred inland environments, whereas the latter are more common in nearshore environments. From this it could be inferred that megalosaurids preferred to “be beside the seaside”. The publication: “A new Theropod dinosaur megalosaurid from the late Middle Jurassic (Callovian) of north-western Germany: Implications for Theropod evolution and faunal turnover in the Jurassic. By: Oliver WM Rauhut, Tom Huebner, and Klaus-Peter Lanser. In: Palaeontologia Electronica 2016. A team of researchers from Ethiopia and the United States have published a remarkable post-mortem on one of the most famous hominin fossils known to science. It turns out that the 3.2 million-year-old Australopithecus afarensis known as “Lucy”, very probably died from injuries resulting from a fall from height, most likely a fall from a tree. Computerised tomography was employed to study the fossilised bones whilst the specimen was on tour of America (Lucy’s Legacy: The Hidden Treasures of Ethiopia). The high resolution scans helped the scientists to determine which of the many fractures in the bones related to injuries and which ones were as a result of more than three million years preserved in strata. A reconstruction of “Lucy” A. afarensis. “Lucy” was discovered in the Afar region in 1974, ironically this hominin got her nickname as “Lucy in the Sky with Diamonds”, the Beatles tune from the album “Sgt. Pepper’s Lonely Hearts Club Band”, had been played repeatedly by the research team at the dig site. It seems that a fall killed her and as since the fossils are associated with a flood plain with trees, it seems highly plausible that “Lucy” fell out of a tree. This new study supports the idea that Australopithecus afarensis spent at least some of its time in the trees. However, adaptations to a more terrestrial life, especially bipedal locomotion may have limited this species in terms of their ability to climb trees. Being better adapted to walking upright meant a trade off between this and tree climbing ability. In the case of “Lucy” this was to lead to fatal results. The fossilised bones of Lucy (approximately 40% of the skeleton). Picture Credit: The world’s most famous fossil, known as “Lucy,” went on display for the first time outside of Ethiopia in the world-premiere special exhibition Lucy’s Legacy: The Hidden Treasures of Ethiopia. The scans revealed a number of perimortem injuries (pathology related to death or shortly before death), particularly a crushed shoulder joint, consistent with a person reaching out their arms to try and break their fall. The scans also revealed traumatic injuries to the ankle, leg bones, the kneecap, pelvis, ribs, skull, jaws and backbone. When the research team examined these injuries and compared them to orthopaedic literature in relation to fall victims, the team found striking similarities between the fractures. A reconstruction explaining the fatal injuries to “Lucy” – A. afarensis after a fall from a tree. In a remarkable analysis the researchers plot the demise of Lucy and comment when each of her injuries was likely to have occurred. The impact would have been so severe as to cause concomitant fractures usually such a fall would also damage internal organs; together, these injuries are hypothesised to have caused her death. When fossils of Australopithecines are examined they appear to have been capable of both terrestrial and arboreal locomotion. The authors suggest that the adaptations that facilitated bipedal, terrestrial locomotion compromised the ability of individuals to climb safely and efficiently in the trees. This combination of features may have predisposed these hominins to more frequent falls from height. Close inspection of other fossils for signs of injury has the potential to offer important insights about hominin lifestyle, through an understanding of the trauma that they suffered and the mechanisms by which they died. With the cooperation of the Ethiopian Government a series of data files have been produced and made freely available to other researchers. In addition, as a result of the 45,000 scans taken by the team, a number of bones from Lucy have been reconstructed, these too will provide valuable learning resources. Professor Kappelman examines casts of “Lucy” – A. afarensis. “Lucy” and her kind the Australopithecus afarensis have been at the centre of a vigorous debate amongst palaeoanthropologists. How much time did these hominins spend in the trees? It is ironic therefore, to hypothesis that “Lucy” died as a result from a fall, probably out of a tree. The fractured bones providing evidence of arborealism within this species. This is one very “cold case” that may have been cracked. One further question to ask, did “Lucy” fall or was she pushed? Everything Dinosaur customer Matthew (the Dinosaur King), has produced another excellent video review of one of his recent model purchases. Talented and knowledgeable Matthew, has created a short video showcasing the rather excellent CollectA Thylacine model. The Thylacine was a marsupial predator, the last known surviving member of the Thylacinidae, a once diverse family of predatory marsupials which were common throughout Australia and New Guinea. In Matthew’s carefully scripted video, the viewer is treated to a detailed look at this new for 2016 replica. The video itself lasts a little over five minutes in duration. In this time, Matthew is able to get over just what an excellent replica the Thylacine figure is. With the model out of its protective packaging, the narrator uses his hand to provide a scale for the Thylacine and the commentary includes a close up look at those gaping jaws and individually painted teeth. Although, scientists know that the Thylacine (Thylacinus cynocephalus – the name translates to “dog headed pouched one”), could open its jaws very wide, it very probably preyed on animals much smaller than itself. The Thylacine was hunted to extinction (it is probably extinct), as it was thought that this nocturnal hunter attacked sheep and other domestic animals. Matthew discusses the demise of the Thylacine in the video, he also speculates on whether or not some small numbers may still survive in the remotest parts of Tasmania or within the wild outback of the Australian mainland. The model represents a female of the species, there is a sizeable joey in the pouch. The tail of the juvenile can be seen sticking out. The design team at CollectA certainly seem to have studied very carefully the few old photographs that show a Thylacine with a distended pouch. The video gives discerning model collectors the chance to view the model in detail. The narrator comments on how accurate and life-like the figure is. The video shows a close up of the black eyes of the Thylacine, a feature noted in the description of the Thylacine written in 1806 by Tasmania’s Deputy Surveyor-General George Harris. As the Cretaceous progressed, so the once diverse and dominant Pterosauria began to be replaced by the rapidly evolving and radiating Aves (birds). When it came to aeronautics, feathers were better than flaps of skin. The last of the flying reptiles, those that survived into the very Late Cretaceous were giants, huge animals some as tall as a giraffe, even the smallest of these Pterosaurs, creatures like Montanazhdarcho minor and Eurazhdarcho langendorfensis had wingspans comparable to the largest volant birds today. It seemed that the last of the Pterosaurs, most of which belong to a single family, the Azhdarchidae, were all big. The small azhdarchoid Pterosaur from Hornby Island (British Columbia). The consensus went something like this, smaller Pterosaurs were gradually out competed by and replaced by birds. However, a newly described Pterosaur fossil from British Columbia, the first of its kind from western North America has challenged this thinking. It seems that smaller Pterosaurs did survive into the Late Cretaceous and their lack of presence in the fossil record probably has more to do with preservation basis than with an inability to compete with birds. The fossilised remains of a small-bodied Pterosaur, an animal that probably had a wingspan of around 1.5 metres, that’s roughly the size of an adult European Herring Gull wingspan (Larus argentatus), were found on Hornby Island, a small body of land on the east coast of Vancouver Island, British Columbia back in 2009. The fragmentary fossils, were located in carbonate nodules and date from approximately 77 million years ago (Campanian faunal stage of the Cretaceous), the finder, a volunteer with the Royal British Columbia Museum, donated the specimen to the Museum. At the time, the fossil material was given to Victoria Arbour, a then PhD student and dinosaur expert at the University of Alberta. Victoria, as a postdoctoral researcher at North Carolina State University and the North Carolina Museum of Natural Sciences, then contacted Elizabeth Martin-Silverstone, a palaeobiology PhD student (University of Southampton) and the Royal British Columbia Museum sent the specimen for analysis in collaboration with Dr Mark Witton, a Pterosaur expert at the University of Portsmouth. The unprepared fossil material in the carbonate nodules. The fossils comprising a partial humerus (upper arm bone), vertebrae and other bone fragments show characteristics that led them to be classified as azhdarchoid Pterosaur material. Previous studies suggest that the Late Cretaceous skies were only occupied by much larger Pterosaur species and birds, but this new finding, which is reported in the Royal Society journal “Open Science”, provides crucial information about the diversity and success of Late Cretaceous Pterosaurs. Line drawings and photographs of the prepared humerus (RBCM.EH.2009.019.0001). The picture above shows photographs and interpretative line drawings of the fossilised left humerus (a, b) dorsal view, (c, d) ventral view, (e, f) proximal and (g, h) distal view. The shading denotes preserved bone cortex (white), weathered bone (light grey) and matrix infill (dark grey). The scale bar in the picture equals ten millimetres, indicating a cat-sized Pterosaur. Late Cretaceous Pterosaur that was cat-sized. The study, which also involved researchers from the University of Portsmouth, North Carolina State University, and the University of Alberta, was funded by the Natural Sciences and Engineering Research Council of Canada. Dr. Mark Witton, as well has having a remarkable knowledge of the Pterosauria and fantastic drawing skills, has authored a number of books on the subject of flying reptiles. In 2013, his marvellous book “Pterosaurs, Natural History, Evolution, Anatomy” was published by Princeton University Press. We at Everything Dinosaur recommend this book, not only for those with an academic interest but also for the general reader. Everything Dinosaur acknowledges the help and support of the University of Southampton in the compilation of this article. Naturalist Sir David Attenborough has had yet another prehistoric critter named in his honour. This time, it’s a kitten-sized marsupial lion, a member of the fearsome Thylacoleonidae family. Sir David has been a long time supporter of the Riversleigh World Heritage site of north-western Queensland (Australia), and it is from these freshwater limestone deposits that fossils representing a new type of marsupial lion were excavated. Microleo attenboroughi – a tiny, arboreal Marsupial Lion. Microleo attenboroughi (Attenborough’s tiny lion) was very probably arboreal and it shared the lush, tropical forests of the Miocene of Australia with a number of other types of marsupial lion. None of them were anywhere near as big as Thylacoleo carnifex of the Pleistocene and despite the extremely fossiliferous nature of the site, only one specimen, represented by some skull fragments and parts of the jaw, of Microleo has been found to date. Microleo is the smallest member of the Thylacoleonidae known to science. A spokesperson from Everything Dinosaur commented that the newly described marsupial lion would have weighed less than an average pet guinea pig. The fossil rich part of the Riversleigh deposits where the Marsupial Lion fossil discovery was made. The fossil was found in a location at Riversleigh known as Neville’s Garden, which has become renowned for its rich diversity of animals. The new species has been described in the academic journal “Palaeontologia Electronica”. Although only fragmentary fossils were found, the maxilla contain an enlarged, shearing premolar tooth in front of the other molars, a specialised feature characteristic of the marsupial lion family. The fossils are believed to be between 18-19 million years old. The relatively tiny tooth row of Microleo attenboroughi (top), compared with the tooth row of its Pleistocene relative, the lion-sized Thylacoleo carnifex. The diversity of marsupial lion fossils from Riversleigh is unparalleled anywhere else in Australia. Despite its small size M. attenboroughi was one of the larger mammalian carnivores known from the limestone deposits. The ancient rainforest environment was certainly extremely rich, although very little evidence regarding the flora has been preserved, the Riversleigh deposits have revealed fossils of tiny koalas, toothed platypuses, possums, kangaroos, reptiles, bats and all sorts of different birds including Australia’s earliest known parrot. The right maxilla and the left maxilla of Microleo attenboroughi with line drawing illustrations (occlusal views). The picture above shows (1) a dorsal view of the right maxilla and a dorsal view of the left maxilla (2). When examining dentition the dorsal view is often referred to as the occlusal view (the view from the top looking down at the biting surface of the teeth). The two line drawings (3) and (4) are illustrations of the right and left maxillas respectively. Picture (5) is a view of molar 3. Key: aabc, accessory anterobuccal cusp; ac, anterior cusp; lb, longitudinal blade; mcl, metaconule; mcus, medial cusp; me, metacone; pa, paracone; pc, posterior cusp; pr, protocone. The researchers hope that more fossil material of Microleo can be found. This would help them work out more about the anatomy of this tiny predator, such as whether or not Microleo possessed an enlarged “killing thumb claw”, like its relative Thylacoleo. JurassicCollectables have produced a video review of the Rebor 1:18 scale, coloured Velociraptor called “Winston” and what a wonderful opportunity to view this new Rebor model close up it is. The Velociraptor figure has been introduced to pay tribute to Stan Winston, the special effects wizard behind the dinosaurs in the first three “Jurassic Park” films. It is these films that really cemented the “raptor” amongst dinosaur fans as one of the most dangerous dinosaurs of all. The Velociraptors in the movies may have been depicted much larger than they would have been back in the Late Cretaceous, but since “Jurassic Park” came out (1993), palaeontologists have identified a number of large dromaeosaurids, links to articles about some of these discoveries are provided at the end of the article, but without further ado, let’s look at the video. In the brief video, (it lasts a little over six and a half minutes), the narrator guides the viewer through the details that can be seen on this carefully sculpted model. The replica stays true to the non-feathered principles of the first “Jurassic Park” offerings and the viewer is guided around the dinosaur with a special focus on the beautifully crafted, articulated lower jaw. A comparison is made between this figure and the Scout series Velociraptor “Stan” introduced by Rebor earlier this year. The “Stan” and “Winston” figures are united in a special, limited edition (1,000 made), bronze effect replica set, JurassicCollectables will be reviewing this figure once Everything Dinosaur has sent out a set to them. JurassicCollectables have a brilliant YouTube channel “ram packed” full of dinosaur model reviews and other very informative videos. Visit the YouTube channel of Jurassic Collectables here: JurassicCollectables on YouTube , don’t forget to subscribe to the JurassicCollectables channel. The Rebor Winston Velociraptor dinosaur model. The picture above shows the Rebor Velociraptor dinosaur model “Winston” as it comes out of the box, it is worth noting that the forelimbs are articulated too, one of several points made by the narrator in the highly informative JurassicCollectables video review. JurassicCollectables conclude that this is an exquisite “raptor” figure, one that would fit in well with any dinosaur model collection. We can’t wait to report on the bronze effect, limited edition “Winston” and “Stan” replica set once the talented folks at JurassicCollectables have published their video review. Below are some articles from this blog site that provide further information on recent “raptor” discoveries. In February 2014, it was announced that a twelfth specimen of the iconic Late Jurassic “dino-bird” Archaeopteryx had been discovered. A private fossil collector was exploring a quarry near the Schamhaupten district of southern Germany (Bavaria), when a slab containing the bones of a vertebrate were unearthed. The specimen was spread over several, fragmented pieces but its significance was quickly realised and experts brought in to prepare the fossil with professionalism and care. This week, after several years of preparation the specimen has gone on display. About to go on display the oldest Archaeopteryx specimen known. The fossil finder did everything correctly, filing the discovery at the district office that manages the quarry. With the specimen logged, palaeontologists were able to set about preparing the delicate fossils (which were softer than the surrounding finely grained limestone), so that the all the details that had been preserved could be revealed. Although all the fossils of this iconic Late Jurassic animal derive from the Solnhofen area of southern Germany, the twelfth specimen, the newest, is also the oldest. The strata in which this fossil was found is at least 200,000 years, possibly as much as 300,000 years, older than the rocks in which other Archaeopteryx remains have been found. For much of the Late Jurassic, western Europe was covered by a shallow tropical sea. Small islands formed an archipelago which stretched from Portugal to France and into Germany and where the land met the water there were extensive lagoons. Some of these lagoons became cut off from the sea and also from terrestrial runoff. They remained relatively still bodies of water that gradually became more saline and anoxic (low in oxygen). These conditions meant that there were few large organisms around to scavenge any carcases should they end up in the water. The lack of current enabled the bodies of organisms to gently become covered by the soft carbonate mud. This led to the fantastic degree of preservation seen in many of the Solnhofen fossils found today. Pointing out the details on the Archaeopteryx fossil. 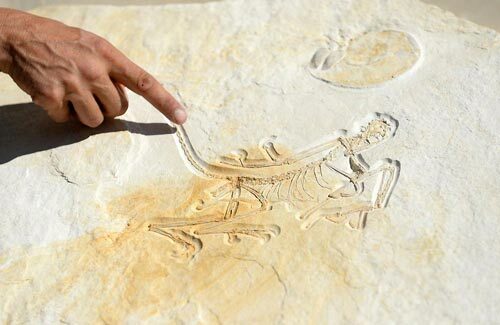 The picture above shows a close up view of the twelfth Archaeopteryx fossil specimen after it has been prepared. The finger in the photograph is hovering just above the long tail. Over the skull of the Archaeopteryx, the flattened fossilised remains of an ammonite can be clearly seen. The ammonite fossil has helped to date the specimen to around 153 million years ago. Palaeontologists have proposed that the presence of the ammonite suggests that the Archaeopteryx was washed out into the lagoon, perhaps in a storm, after which, it and the corpses of other animals unfortunate to have been caught out in the bad weather came to rest. The picture above shows an interpretation of Archaeopteryx, a model made by Safari Ltd and introduced in 2015, this replica is part of the Wild Safari Dinos collection, to view the models: Wild Safari Dinos. The model has been given a coat of black feathers, this reflects some of the latest research into the colouration of Archaeopteryx lithographic published at the time. This twelfth Archaeopteryx specimen will be put on display at the new Dinosaurier-Freiluftmuseum Altmühltal in Germany. The picture above shows the coloured version of “Winston”. It is beautifully painted and if you compare it with the picture below, you should be able to note another feature of this particular Rebor replica, one that is shared by the bronze effect “Winston” in the “Father and Son” Velociraptor model set. Straight out of the box! A Rebor Velociraptor model (1:18 scale model). The two pictures above show the Velociraptor replica, they have been taken with the ties still on the model but there is a difference between the two photographs, can you spot it? Yes, that’s right the forelimbs in the pictures are in different positions. Both the “Winston” and the “Father” replicas have articulated arms. This enables collectors to position their “raptors” in different poses. The lower jaws in both models are also articulated. Rebor have striven to give the new Velociraptor replicas a dynamic pose and the design team have certainly achieved a wonderful effect. Discreet pins in the base fit securely into sockets under the feet, this helps to stabilise the model as it balances on those delicately crafted Velociraptor toes. The red arrow points to the discrete pin that helps to secure the Velociraptor model. When the model is secured to the base the pins cannot be seen. The bronze effect, limited edition Velociraptor model set, nick-named “Father and Son”, consists of a “Winston” accompanied by “Stan”, the baby Velociraptor introduced recently into the Rebor “Scout” model series. The adult dinosaur in this set also has articulated front limbs and an articulated lower jaw. The bronze effect paint work has been very well done and the models have an almost pewter-like quality to them. The bronze effect Velociraptor dinosaur model. To purchase the limited edition Velociraptor model set (whilst stocks last), check out Everything Dinosaur’s Rebor model section: Rebor Models and Replicas. Only one thousand of these bronze effect sets have been made, those collectors lucky to get hold of one will have something really special to add to their dinosaur model collection. Today’s blog post is dedicated to all those hard-working, dedicated people who made the 2016 Olympic games in Rio such an amazing success. We pay tribute to the organisers, the administrators, the game-makers, team members, technicians, broadcasters and fans, it has been a fantastic two weeks of sport and we hope that the Olympic ideals will continue to inspire people around the world – “Citius, Altius, Fortius”! A special mention to team GB who enjoyed their most successful Games in terms of medals since 1908. Back in 1996, when the summer Olympics was held in Atlanta, Georgia (USA), Great Britain achieved at total of fifteen medals, with only one gold*. Twenty years later and it is a very different story. From finishing thirty-sixth in the medal table two decades ago, Great Britain in Rio won a total of sixty-seven medals, twenty-seven of them gold. Team GB certainly did a nation proud, finishing second in the medal table for the first time in 108 years. Team GB were the first team to increase its medal count in five successive Games and we are the only host nation to go on to win more medals at the following Olympics. So how do we at Everything Dinosaur mark this achievement? With dinosaurs of course. Tyrannosaurids celebrate success at the Olympic Games (Rio 2016). 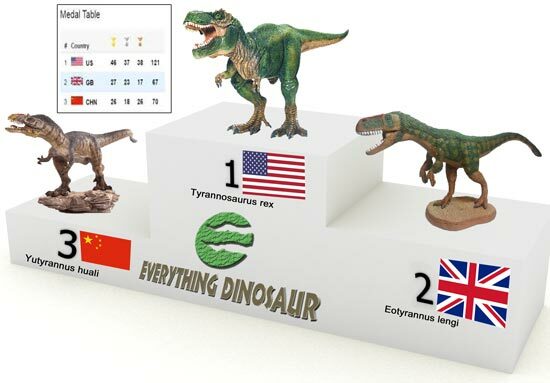 Whilst it might look a little strange to place dinosaurs onto a podium and to link a nation’s sporting success to the Dinosauria, some parallels between the medal table at the end of the Rio Olympics and the study of dinosaurs can be drawn. For example, in the early days of this particular branch of vertebrate palaeontology, Great Britain led the way with a number of eminent scientists making important dinosaur discoveries. After all, the first three types of dinosaur to be scientifically described were described from fossils found in England. Great Britain had a lot of early success in the first of the modern Olympic Games to be held. However, countries like China and the United States gradually became more and more dominant – just as with the Dinosauria with many more different types of dinosaurs now known from America and the Peoples Republic of China. To have Team GB finish above China in second place in 2016 is quite remarkable. Perhaps the Chinese can take solace in the fact that now, great institutions such as those encompassed by the Chinese Academy of Sciences, have amassed far more fossilised bones of dinosaurs than any other country. When it comes to new dinosaur discoveries and their frequency, it could be argued that China leads the way. One other point to note. Standing on the podium in their respective positions are three types of tyrannosaurid. China is represented by Yutyrannus huali, whose fossils come from Liaoning Province. In the silver medal position is Eotyrannus lengi a member of the Tyrannosaur family whose fossils are associated with the Isle of Wight (Great Britain), sitting on top, is perhaps the most famous dinosaur of all Tyrannosaurus rex. Yes, we know that Tyrannosaurus rex is also associated with Canada and Mexico, but as it is mostly known from fossil material excavated from the Hell Creek Formation of Montana, we thought that using T. rex to represent the United States would be appropriate. The term “Olympic Family” is often used to represent nations coming together. The Rio Olympics has been a truly global event and when it comes to dinosaurs such as the tyrannosaurids, these animals too seem to have had an almost global distribution. We also note from our sales, that dinosaur models, toys and games have a world-wide appeal. Thus ends our tribute to everyone involved in the Games, we look forward to Tokyo in 2020. We have four years to learn all about Japanese dinosaurs. gold* – Matthew Pinsent and Steve Redgrave — Rowing, Men’s Coxless Pair (both of which were later knighted).